With just two days left, the federal government's principal agencies in Washington Wednesday were telling everyone in every way they could that they're ready for Y2K, CBS News Correspondent Diana Olick reports. The President's Council on Y2K says 99.9 percent of mission critical systems are ready, and the Federal Emergency Management Agency has established 10 regional centers to monitor potential catastrophes in the United States and its territories. Beginning Thursday, FEMA will have its emergency support team in full gear 24 hours a day through Jan. 2. More than 800 personnel will be working through the weekend. 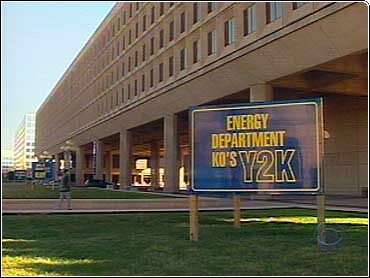 FEMA's Robert Adamcik says, "We are prepared to respond just like we would for any other natural disaster or any other emergency situation anywhere in the continental U.S."
The Pentagon showed off its Y2K ready room, staffed for the first time on Wednesday. Its Moscow tie-line is ready to respond to any miscommunications about nuclear weapons. Across town, the Department of Energy has already tested its video hotline to Moscow, ready to respond to problems with nuclear power plants. Power grids from California to Maine are also under a watchful eye. "They're connected to their private companies throughout the country and that information will all come in to this center," explains T.J. Gauthier, Deputy Secretary of Energy. Reports are then relayed to the Federal Information Coordination Center near the White House. The ICC will monitor what's working and what's not, everything from social security checks to air traffic control to defense department early warning systems. According to Janet Abrams, of the President's Council on Y2K, "It is a delicate balance because, really, Y2K is as much about people as it about is it about computers." She's talking about making sure there's no human meltdown. That's where public relations specialists come in, to filter the information. "If there's a widespread problem people deserve to know that, we want to make sure that information gets out," Gauthier explains. "If it's a narrow problem then they deserve to know that. And we want to make sure that whatever they have is put in perspective." That's what the ICC is really all about --not just monitoring the systems, but making sure any minor technical problems don't trigger a major panic.